These are the BEST Carrot Cake Muffins. 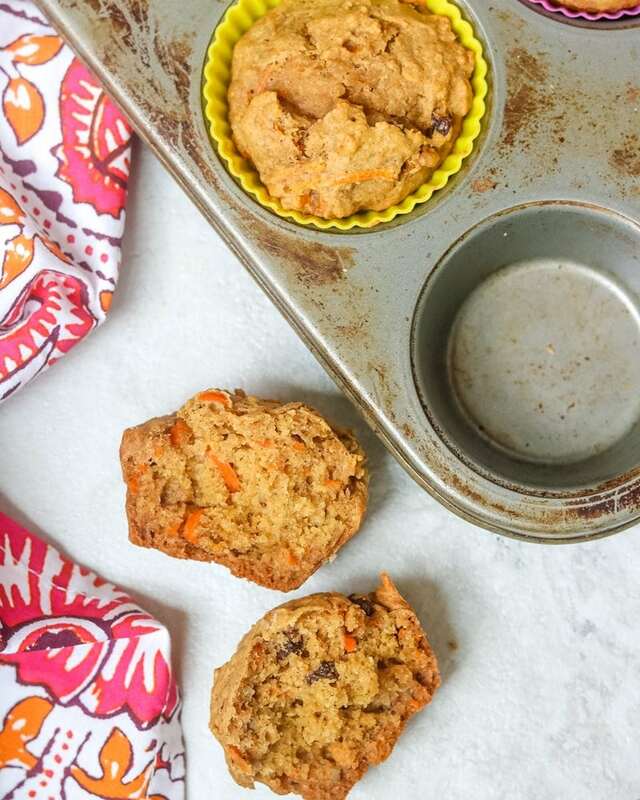 This healthy carrot cake muffin recipe is naturally sweetened and made with 100% whole grains but still tastes 100% delicious! Modifications included egg free/vegan carrot cake muffins if needed. Serve these Carrot Cake Muffins with Ham and Cheese Quiche or an Asparagus Frittata for a fabulous Easter Brunch or causal brunch for your friends. I am not really a cake person. But I do love carrot cake. But since cake, even with a healthy dose of veggies, isn’t exactly acceptable on a daily basis, I opt for these Healthy Carrot Cake Muffins. 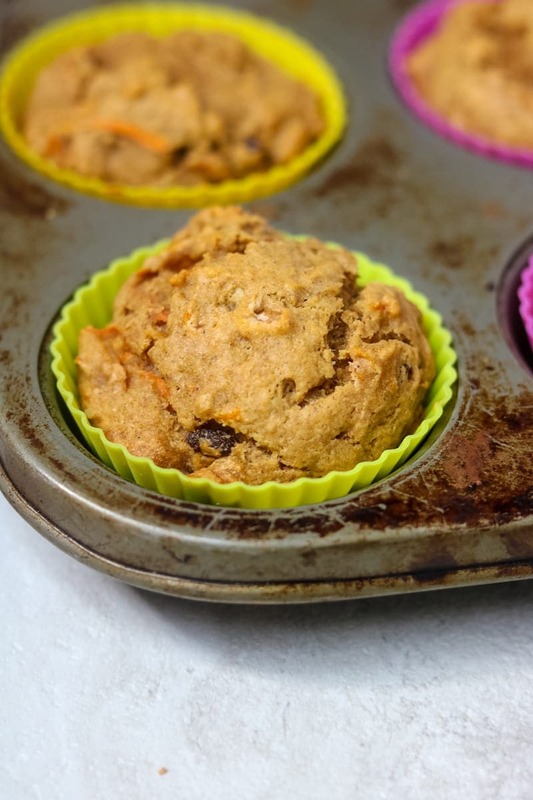 These Carrot Cake Muffins are full of whole grains, fruit, vegetables, natural sugars, and healthy fats. 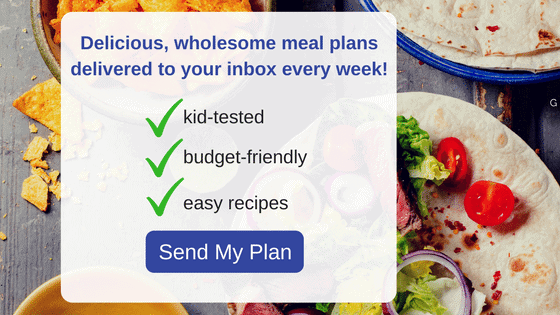 They will provide your family with a healthy treat that feels indulgent. They are light and tender, despite being made with 100% whole wheat flour. And every pocket of the muffin is filled with a delicious nugget of raisins, carrots, or nuts. Coconut oil and applesauce keep the muffins tender and moist, even while still being 100% whole grain. Raisins, honey and applesauce keep these carrot cake muffins naturally sweet. Whole wheat flour, carrots, and fruit give you a healthy dose of fiber–not to mention vitamins A and B and iron. Coconut oil and walnuts provide you with healthy fats and omega-3 fatty acids. Grease a 12 cup muffin tin or line with silicone muffin liners. 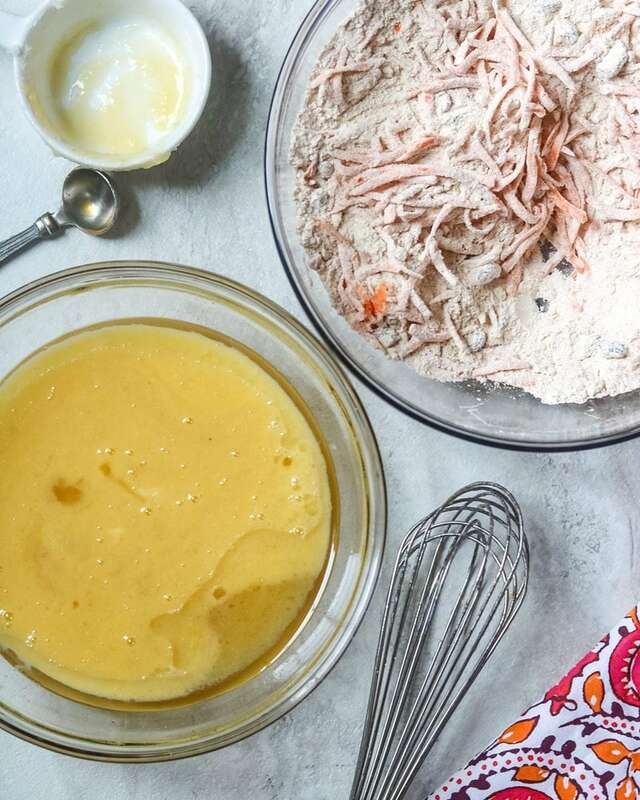 Mix together dry ingredients in a large mixing bowl. Add in carrots, raisins, and nuts and toss well to coat with flour. This step helps all those goodies to not sink to the bottom of the muffins. Stir until just combined–do not over mix or you will have a tough and dense muffin! Scoop about 1/4 cup batter into each muffin tin. Bake until muffins are set and toothpick inserted into center comes out dry. When baking with whole grain products, it is best to refrigerate or freeze whole wheat muffins, or any whole wheat products if not consuming within 2 days. 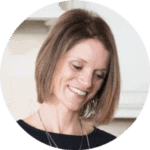 Place muffins on a cookie sheet and freeze for 30-60 minutes until solid–this process helps muffins not stick together when placed in container in freezer. Then place in freezer safe bag and pull one muffin out at time. Defrost in fridge overnight, or warm in microwave for 1-2 minutes to heat before serving. Whole white wheat, ivory wheat, and whole wheat flour all work perfectly for these carrot cake muffins. Even all purpose flour will work in this recipe. Be sure to just combine wet and dry ingredients until combined in your carrot cake muffin batter. Over mixing the muffins, will cause for tough muffins. Golden or regular raisins both work in this recipe. To make Gluten Free Carrot Cake Muffins: use an all-purpose gluten-free flour blend in place of whole wheat flour. 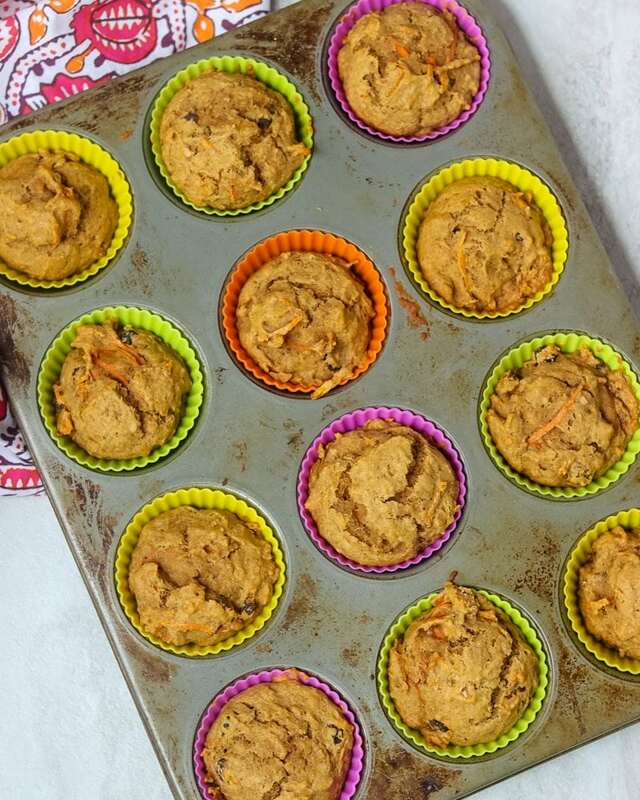 To make Egg Free Carrot Cake Muffins: replace egg with 1 tablespoon ground flax seed mixed with 3 tablespoons water. Omit nuts for a nut free carrot cake muffin. Feel free to use canola oil in place of coconut oil. I prefer the taste of coconut oil to canola oil in baked muffins, but either oil will work. Be sure to use unsweetened applesauce to keep these muffins low in added sugar. To make Vegan Carrot Cake Muffins: use maple syrup in place of honey and a flax egg in place of the egg. For more traditional Carrot Cake recipes, check out Mom on Timeout’s To Die For Carrot Cake or Crazy for Crust’s Carrot Cake Roll. Preheat oven to 350 and line a muffin pan with liners or grease well. Mix together the oil, vanilla, egg, honey and applesauce and add to dry ingredients. Mix until just combined--the batter will be thick! Scoop with an ice scream scoop into the muffin tin. Bake for 20-25 minutes. To make Egg Free Carrot Cake Muffins: replace egg with 1 tablespoon ground flaxseed mixed with 3 tablespoons water. Yum! Such a perfect and festive recipe for Easter 🙂 I love carrot cake so I’m sure these muffins would be awesome! These look great – I might try them with white whole wheat flour, which I find to be a bit less heavy than “regular” whole wheat. In any event, I adore carrot cake muffins. Yes, white whole wheat flour would be less dense. I hope you enjoy! I love all the carrot cake recipes popping up lately. Yum! Carrot Cake is such a great treat. I love that this recipe does not have pineapple in it. I feel like there must be 2 carrot cake traditions out there–or carrot muffins–one with pineapple and one without. I am always bummed to see the pineapple lol. These look great! Yummed! Ha! Yes, I personally like both versions, but glad you these suit your tastes Laura. These look so fluffy and delicious! Can’t wait to try them! 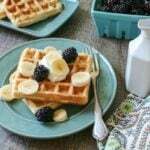 Love all the great ingredients you use in these muffins! I feel good about feeding all of this to my kids. They are a great healthy treat for kids for sure! Do you think I could replace the oil with fat-free Greek yogurt? Hi Regina! I think you can easily, just knowing the muffins will be a bit denser, but still delicious. Enjoy! My youngest loves carrot cake. Will totally have to make this for him. Thank you for sharing. Store-bought muffins are filled with sugar.. I love that this is a healthy version of muffins! I feel good about serving them to my family, Delicious. So glad you enjoyed these healthier muffins!